Don’t let the party go dull. You can add some light with our glow stock holder barbell. 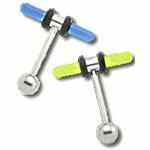 This 14g (1.6mm), 5/8” (16mm) stainless steel barbell can hold a mini glow stick to help you add some color and a gentle glow. These are a perfect touch for any party, rave or Halloween bash you may attend.